For those unfamiliar with the tangle of train lines in south London, getting to grips with the official route map can be a bit of a headache. Max Roberts — an expert on metro mapping, whose radical designs we've discussed previously — has now reworked the network into a circle map. Below, Max explains the background and rationale behind his new map. Judge for yourself whether it is an improvement on the official version. Historically, the Underground never had a monopoly of frequent electric services in London, and south of the River Thames, a journey by train would usually involve the Southern Electric network, unfortunately. But why should the Underground get all the circles? I've had my sights on south London for a while now, and after four attempts have finally got something that works reasonably well. Like all circles maps, this one has strengths and weaknesses. It struggles to tame the network in places, with many lines not quite radial and not quite orbital. The inherent complexity of the system is reflected in the final design, a good map can't fix a bad network. In fact, this is only one of two designs where I had to refer to a track plan in order to be sure that I was getting it right (New York was the other). I was born in South London and endured the Southern Electric for two decades. I'm fully aware of everything I have had to do in order to get this one to work. All compromises and distortions were made with good reason. Any commentators wishing to complain about the geography or the shape of the design should refer back to current TfL maps of London's railways as a comparison. Only Henry Beck, on his unpublished London Railway diagram from the 1930s managed a reasonable shape for the Southern Electric, although his attempt was full of errors. Max has crafted circular maps for many cities, including New York, Madrid and Berlin. 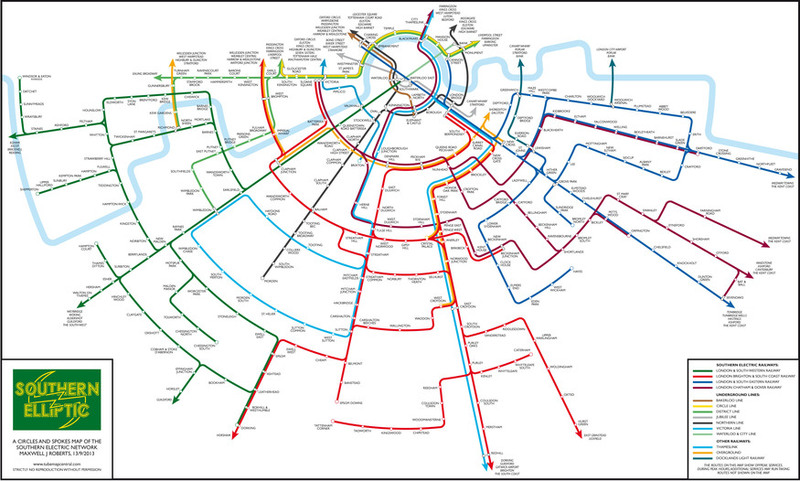 The south London circular rail map follows on from his reworking of the standard tube map.